Club-ABLE welcomes your decision to join us as a Preferred Provider. Please complete this one page document you will received document by email. 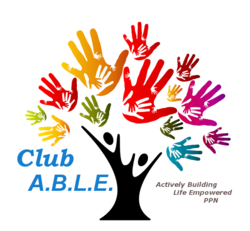 Please sign up and return to us at the enable@club-ABLE.com. I hereby certify that I am currently Licensed to Practice in the State of California as per the above designation(s). I am the Owner/ Manager of the business named above. My business has the necessary licenses and permits to carry out the business and to supply the services and products as stated. I agree to offer a ____ % fee discount for my services / products from my regular fair market pricing to the physically disabled community members of Club-ABLE. I understand that Club-ABLE members will show me their Club-ABLE ID and then settle their accounts directly with me. It is my responsibility to determine how and under what fee terms I am willing to offer my services / products provided that I offer at least a 10% discount to members of Club-ABLE. This Statement of Agreement will be posted on the Club-ABLE website so that members may determine if they are interested in my services / products. I agree to the above terms and hereby grant permission to Club-ABLE to post this Statement of Agreement on their web site and to give a copy of it to any member that expresses an interest in my services/ products.